Lumbar degenerative disc disease commonly affects patients in their 30s and 40s. Patients' symptoms manifest mainly as axial mechanical lower back pain. Magnetic resonance imaging (MRI) findings include decreased disc height, loss of T2-weighted signal within the disc, and disc bulging. Some patients manifest degenerative disc disease symptoms in their teen years. Ideally, symptoms are managed non-operatively but in some patients pain management fails and patients are significantly disabled and/or require high narcotic pain medications. A couple of recent Food and Drug Administration (FDA) Investigational Device Exemption (IDE) studies demonstrated the effectiveness of lumbar total disc replacement (TDR) in the treatment of degenerative disc disease in adults. , Older patients (age > 60) are not considered good candidates for TDR because of associated facet arthropathy and other degenerative changes. There are no reports of the use of lumbar disc replacement in adolescents. The authors report their initial experience with 2 children who underwent TDR at their institution. A 13-year-old girl presented with complaints of predominantly lower back pain. The pain was fairly constant and worsened on sitting down but was relieved on lying down with occasional radicular pain. She failed non-operative management including epidural steroid injections and courses of various medications. MRI revealed overall good alignment with disc degeneration appreciated at L4-5 [Figure 1]. Recommendations were made to continue conservative management. The patient eventually had a lumbar discectomy at L4-5 at an outside hospital at the age of 15 years. She had no improvement with a lumbar discectomy and presented to us again with lower back pain interfering with her ability to participate in school and requiring regular narcotic pain medication. There were no significant changes in follow-up MRI scans. The patient underwent a L4-L5 artificial lumbar disc replacement through a left anterior retroperitoneal approach. The standard surgical technique was used as described in adults. The patient did remarkably well with almost complete resolution of her back pain from a pre-operative VAS score of 9/10 to 1/10 at 6 months follow-up after the surgery. She was also off her narcotic pain medications. 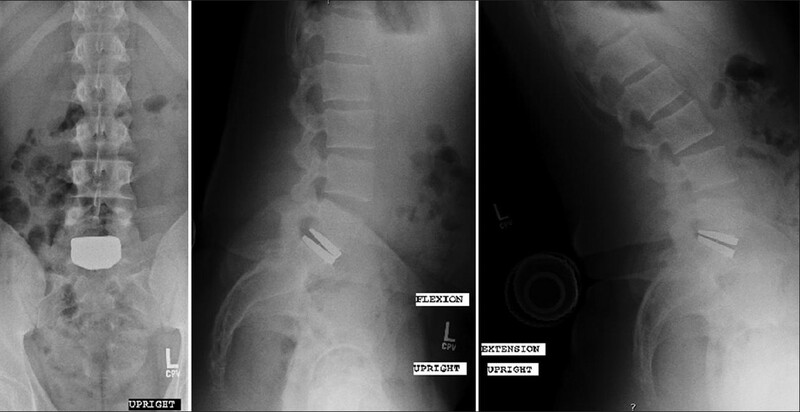 Post-operative X-ray revealed good disc placement [Figure 2]. A 17-year-old teenager secondary to complains of back and right lumbar radicular leg pain underwent a L5-S1 microdiscectomy at another institute. Though the leg pain improved after surgery, he continued having axial lower back pain requiring regular narcotic pain medications with interference in activities of daily living and participation in sports. 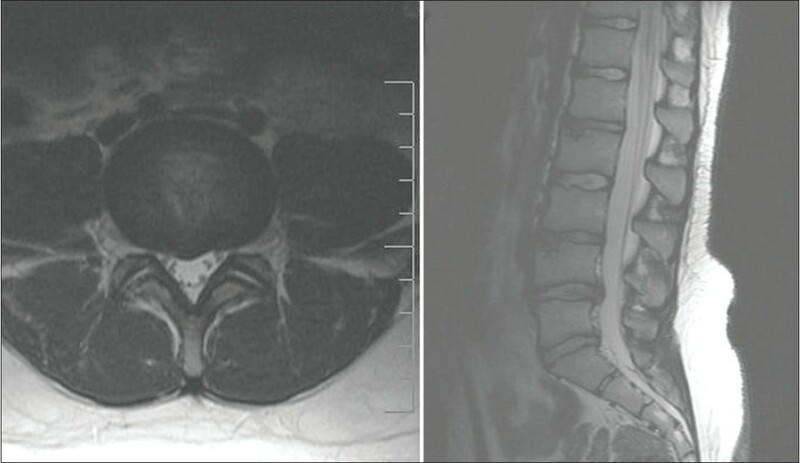 MRI showed disc degeneration involving L5-S1 level with no evidence of any significant disc herniation [Figure 3]. He failed trials of multiple epidural injections, physical therapy, pain medications and other conservative measures. The patients' pain usually worsened while sitting down and improved with changes in position appearing to be discogenic in nature. A discogram done was positive for L5/S1 disc as the pain generator. After careful pre-operative counseling and discussion of treatment options with the family, the patient underwent L5-S1 disc replacement. Unfortunately, he did not had much improvement after surgery with reduction in pain from a pre-operative VAS score 9/10 to 5/10 despite post-operative X rays at 6 months follow-up showing well-placed implant with preserved motion at the operated level [Figure 4]. Management remains controversial. MRI scans in up to a third of 20-year-olds show some degenerative changes. Disagreement exists regarding the localization of the disc as the cause of pain in adults. , Diagnosis is somewhat easier in younger patients because multi-level degenerative MRI changes are not normally seen in the younger age group. Other cause of lower back pain in the younger age group should also be excluded including psychological disease, viral myalgia, sickle cell disease, infection, spinal deformity, fracture, or urological disease. Non-operative treatment should always be maximized. , Fusion surgery for back pain in a pediatric spine exposes patients to a larger overall risk of adjacent segment degeneration which is well described in adults considering their longer expected life span. This probably explains the reluctance among spine surgeons to fuse children or adolescents with back pain as the predominant symptom in the absence of radiculopathy. 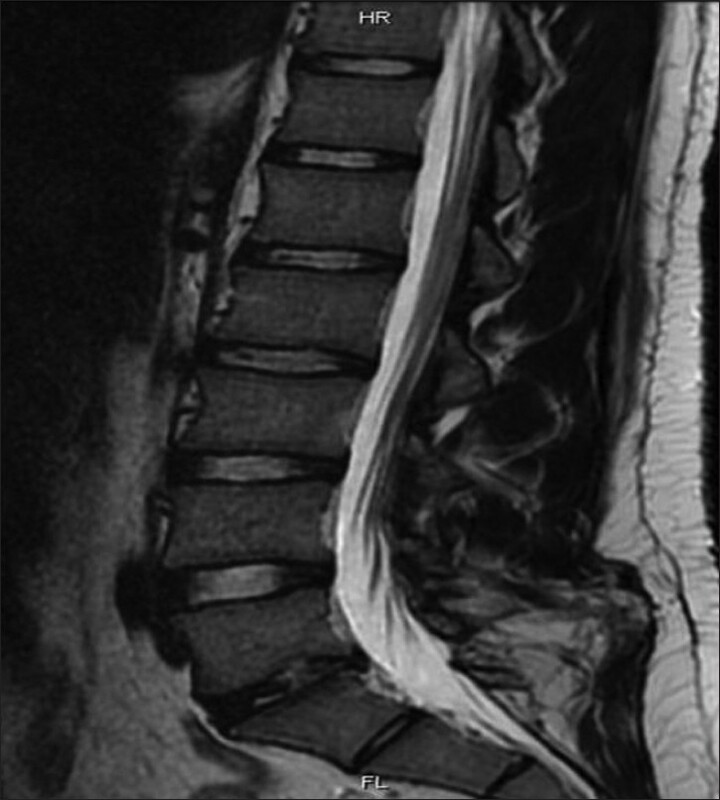 Availability of TDR theoretically might help such patients who generally have single degenerated disc and can be treated with lumbar disc replacement bypassing the problems associated with fusion at an early age. Though the exact role of discography is controversial, it can be of help in pin-pointing the cause of back pain to a single disc in patients with multilevel disc degeneration which generally is uncommon in children. Several prospective randomized trials in carefully selected adult patients demonstrated arthroplasty as an effective treatment for degenerative disc disease. , The FDA IDE studies for the Charite and Prodisc artificial lumbar disc showed that about two thirds of carefully selected patients improved with surgery. , Five-year follow-up in the Charite group show over 55% of patients with long-term improvement in symptoms as defined by the FDA success criteria. Maintaining motion at the disc level after disc replacement innately appears more physiological. There have been no studies or reports of technical feasibility and outcome following TDR in children. Selection of younger patients for TDR surgery should be carefully considered and all other options should be exhausted prior to surgery. Our small experience shows results similar to adult TDR surgery with one patient showing improvement while the others demonstrating no significant improvement despite a technically successful surgery. Though there are studies reporting good outcomes with maintenance of range of motion up to 10 years after disc replacement in adults,  similar data in pediatric age group is lacking due to rarity of such procedures in children which at the best should be avoided. The short follow-up in this report represents a significant shortcoming and leaves unanswered the long-term outcome of TDR in pediatric patients. Also the unpredictable nature of the outcome reported in this series further highlights the complex nature of back pain with multifactorial etiology which cannot be fully addressed with motion preservation alone. Another consideration is the performance of the artificial disc in pediatric population who are more active and athletic than the general adult population raising the possibility of early implant wear and failure. Decision-making in management of degenerative disc disease back pain in children can be challenging. Non-operative treatment options are preferable. The availability of artificial lumbar disc and the technical possibility of performing it in the adolescent age group as described in this paper may widen the treatment options and can be clinically important for this subgroup of patients. Though technically not difficult, successful surgery with motion preservation may not be synonymous with good outcome and role of TDR in pediatric patients needs to be proven in further studies with long term follow-up. 1. Blumenthal S, McAfee PC, Guyer RD, Hochschuler SH, Geisler FH, Holt RT, et al. 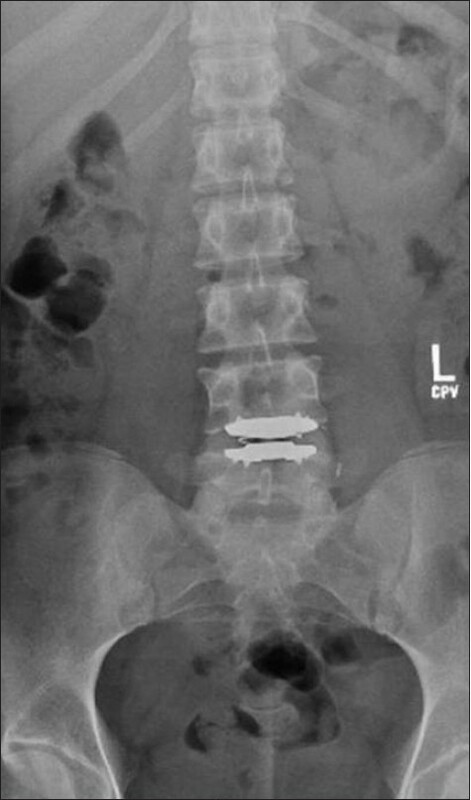 A prospective, randomized, multicenter Food and Drug Administration investigational device exemptions study of lumbar total disc replacement with the CHARITE artificial disc versus lumbar fusion: part I: Evaluation of clinical outcomes. Spine (Phila Pa 1976) 2005;30:1565-75. 2. Zigler J, Delamarter R, Spivak JM, Linovitz RJ, Danielson GO 3rd, Haider TT, et al. Results of the prospective, randomized, multicenter Food and Drug Administration investigational device exemption study of the ProDisc-L total disc replacement versus circumferential fusion for the treatment of 1-level degenerative disc disease. Spine (Phila Pa 1976) 2007;32:1155-62. 3. Tropiano P, Huang RC, Girardi FP, Cammisa FP Jr, Marnay T. Lumbar total disc replacement. Surgical technique. J Bone Joint Surg Am 2006;88 Suppl 1:50-64. 4. Cahill KS, Dunn I, Gunnarsson T, Proctor MR. Lumbar microdiscectomy in pediatric patients: A large single-institution series. J Neurosurg Spine 2010;12:165-70. 5. Ishihara H, Matsui H, Hirano N, Tsuji H. Lumbar intervertebral disc herniation in children less than 16 years of age. Long-term follow-up study of surgically managed cases. Spine (Phila Pa 1976) 1997;22:2044- 9. 6. Micheli LJ, Wood R. Back pain in young athletes. Significant differences from adults in causes and patterns. Arch Pediatr Adolesc Med 1995;149:15-8. 7. Nachemson A, Zdeblick TA, O'Brien JP. Lumbar disc disease with discogenic pain. What surgical treatment is most effective? Spine (Phila Pa 1976) 1996;21:1835-8. 8. Kjaer P, Leboeuf-Yde C, Sorensen JS, Bendix T. An epidemiologic study of MRI and low back pain in 13-year-old children. Spine (Phila Pa 1976) 2005;30:798-806. 9. Salminen JJ, Erkintalo MO, Pentti J, Oksanen A, Kormano MJ. Recurrent low back pain and early disc degeneration in the young. Spine (Phila Pa 1976) 1999;24:1316-21. 10. Taimela S, Kujala UM, Salminen JJ, Viljanen T. The prevalence of low back pain among children and adolescents. A nationwide, cohort-based questionnaire survey in Finland. Spine (Phila Pa 1976) 1997;22:1132-6. 11. Fischgrund JS, Montgomery DM. Diagnosis and treatment of discogenic low back pain. Orthop Rev 1993;22:311-8. 12. Cheh G, Bridwell KH, Lenke LG, Buchowski JM, Daubs MD, Kim Y, et al. Adjacent segment disease following lumbar/thoracolumbar fusion with pedicle screw instrumentation: A minimum 5-year follow-up. Spine (Phila Pa 1976) 2007;32:2253-7. 13. Huang RC, Girardi FP, Cammisa FP Jr, Tropiano P, Marnay T. Long-term flexion-extension range of motion of the prodisc total disc replacement. J Spinal Disord Tech 2003;16:435-40.